Listen Like a Lawyer is grateful to Professor Heidi K. Brown for this guest post. Professor Brown is an Associate Professor of Law and Director of the Legal Writing Program at Brooklyn Law School. 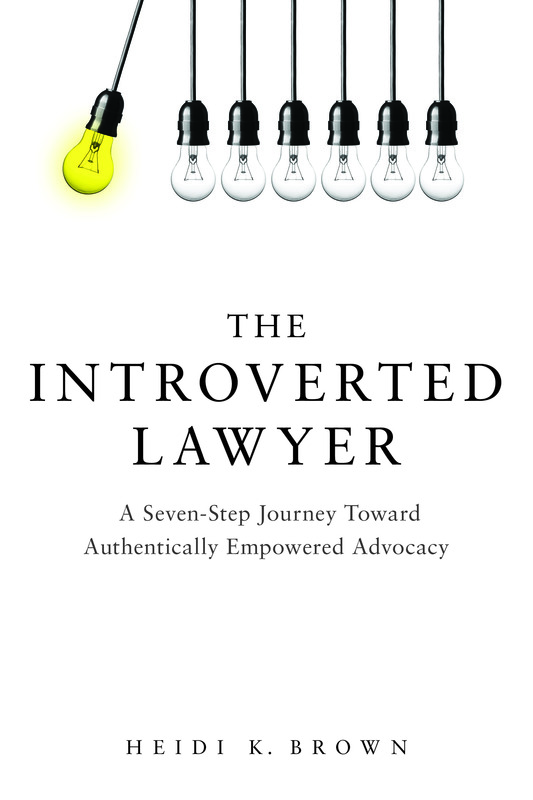 Having struggled with shyness and social anxiety as a law student and litigator and, through substantial research and self-study, embraced introversion as a powerful asset in studying, teaching, and practicing law, her passion lies with helping quiet law students find their authentically impactful lawyer voices. Her book, The Introverted Lawyer, is forthcoming from Ankerwycke Books in Summer 2017. In a song called Every Breaking Wave, Bono of the Irish rock band U2 sings, “It’s hard to listen while you preach.” Poignant advice for lawyers. Even so, the American lawyer stereotype epitomizes vivacious talkers much more so than quiet observers and absorbers. Good lawyers must stop talking and not only hear but listen to their clients, opponents, and decision makers in their client’s cases. Similarly, great law professors listen to their students, to ascertain what these learners do and do not know or understand so as to facilitate intellectual growth. In their book Essential Lawyering Skills, authors and law professors Stefan H. Krieger and Richard K. Neumann, Jr. emphasize, “The ability to listen well is as important in the practice of law as the ability to talk well.” Similarly, in their book Lawyers as Counselors: A Client-Centered Approach, authors and law professors David A. Binder, Paul Bergman, Paul R. Tremblay, and Ian S. Weinstein explain that active listening—defined as “the process of picking up clients’ messages and sending them back in reflective statements that mirror what you have heard”—is a vital lawyering skill. Through active listening, we “demonstrate empathy and understanding,” building trust relationships with our clients to facilitate information-sharing and pave the way for impactful advocacy. Listening is an intentional and mindful act. It involves action, not passivity. It’s a conscious choice. While quieting down and ceding the stage to a client or opponent might not come naturally for an extroverted lawyer who thrives and revels in verbal volley and less so in silence, concentrated listening is a powerful innate competency for an introverted advocate. Introverts listen well. They possess a natural affinity for quietude, preferring to step into external stimuli gently, surveying and processing multiple competing sensory triggers before contributing to the cacophony. Introverts appraise their surroundings, actively hearing, smelling, seeing, touching, and tasting before jumping into the fray. Introverts resist interruption, to their own thought processes as well as others’—which enhances listening abilities. Before speaking, introverts absorb, synthesize, and discern. Sometimes too many external data sources can be overwhelming for introverts. But in law-related contexts, quiet introverts can be the most effective listeners in the room, tuning out distractions and focusing on the issues at hand. In one-on-one client interviews, for example, introverts pay attention to spoken words and unspoken emotional markers. Perceiving a client’s flinch or a break in eye contact, an introverted lawyer’s nod or encouraging “it sounds like this situation has been stressful for you” can facilitate instead of stifle the client’s continued dialogue. In group meetings and negotiations, rather than immediately speaking, introverted lawyers process facts, rules, and legal theories internally before sharing them externally, which often allows them to extract items of group consensus and discord that other participants talking over one another miss. Additionally, scientists have linked introversion and empathy. Introversion author, Dr. Arnie Kozak, indicates that “[i]ntroverts can be highly sensitive to the needs of others.” He explains in The Everything Guide to the Introvert Edge that “[t]he ability to sit still can nurture compassion and empathy.” This natural empathy enhances the introvert’s ability to listen patiently to others and resist projecting personal biases and agendas. Some extroverted law students, law professors, and lawyers might erroneously perceive introverted students or attorneys as disengaged or not assertive enough. In reality, they routinely are just-right-engaged (or even over-engaged) and their legal solutions—initially formulated through listening, and ultimately vetted through quiet contemplation—possess profound might. Next time you’re in a classroom, conference room, or courtroom, notice the quiet ones. And when they speak, listen. Their words will pack a punch. In the holiday season, listening to family and friends can be a perfect gift. It doesn’t cost money and it’s deeply meaningful for the recipient. For the giver, sitting down with a cup of coffee and a friend can be a respite from the hectic, distracted, too-many-things-to-do feeling that ushers in the season. [S]how up with your natural curiosity, sense of humor and ability to listen. We all want to be seen and heard, and you’re giving a tremendous gift to a prospect or colleague [LLL: or relative or friend] when you really listen and give her your undivided attention. Happy holidays to Listen Like a Lawyer’s readers. May each of you give and receive the gift of listening this holiday season.